Leduc Fire Services Chaplain Ken Rodeman related many stories of his life's work concerning faith and the fire services during his presentation at the 2013 Mayor's Prayer Breakfast in Leduc. The annual Mayor's Prayer Breakfast is an event that is looked forward to by many people in Leduc's faith community every year. It is always extremely well put together with good food, great fellowship, beautiful music, and a captivating speaker, and I am happy to report that this year all those high points were achieved yet again! The morning did open with a unique twist this year, in that the head table was piped into the room and to their seats by bagpiper Rayn Cunningham, who represented the Leduc Firefighters and their honour guard. It made for a very definite beginning to the morning's events. Pianist Shannon Hiebert and vocalists Iren Bartok and Mairi Irene McCormack held the audience in rapt silence during their duets of All Creatures Of God Our King, and the Flower Duet by Delibes. Their classically trained and stunning voices wound around and through one another so beautifully that it drew several awed comments from the audience on their considerable talents when they were done. In Mayor Krischke's welcoming address he was very clear in stating that this was not a City event, but rather a Ministerial event event that had the support of the City. He then thanked the Christian Ministerial Association for leading Leduc's flock. The breakfast was a completely sold out event with eleven different municipalities in attendance on this morning, including representatives from Sturgeon County, Strathcona, Beaumont, Calmar, Warburg, Redwater, and Leduc City and County to name just a few of them. Mayor Krischke concluded his welcome by saying that "All of you who believe in a higher power make our area a wonderful community in which to live. We truly have a lot to be thankful for!" MLA George Rogers was then welcomed to the podium to say a few words, and he got everyone laughing with the opening line; "Lord, if you're listening, I'm getting a little tired of the white blessing outside!" He continued on to say that when he travels to other parts of the world and then returns to Alberta, he almost wants to kiss the ground because he realizes how blessed we really are here. It was at this point that the main speaker for the morning was introduced and welcomed on stage. Pastor Ken Rodeman has been Chaplain for Leduc Fire Services for almost 25 years, and over that time he has seen his fair share of both tragedy and miracles. He gave many instances of how he had seen God, faith, and the power of prayer work in his many years in the fire service, but one of the strongest stories he told was the one about his own life and how he came to be a pastor in the first place. He stated unequivocally that it was due to the power of prayer that he was in the Ministry at all. Ken shared the story of how he had been born prematurely, with several health issues that did not all show up immediately, due to his mother's choice to drink and smoke during her pregnancy with him. The main physical disability that doctors noted right away was that Ken had been born almost blind, and with a degenerative eye condition that would steal his sight completely away as he aged. To make things even more difficult for someone with vision difficulties, once Ken reached the age to attend school it was discovered that he was also dyslexic! However, coke bottle glasses and all, he said that "All the way through school God provided me with friends that helped me study, learn, and make it through my tests." After his formal schooling was completed Ken decided to enter the seminary, and it wasn't until he was 20 years old during a conversation with his aunt and uncle, he discovered the real reason behind the miracle he was experiencing. "Despite the fact that the doctors had told me the disease I had would eventually render me blind, by twenty years old I had my eyesight tested and I was so close to having 20/20 vision that I no longer needed glasses at all!" he stated. "The doctors couldn't explain it because they had never seen anything like this before, and I shared that with my aunt and uncle one day. It was then they told me that they had prayed for me every night while I was in seminary that my eyesight would improve because they just knew I was destined to become a pastor. That is why I always say; clear communication! Prayer does things! It works." He also shared stories of having seen the power of prayer work on firefighters that had been grievously injured in the line of duty, and quoted from author Dale A. Mathews book titled "The Faith Factor". According to Mr. Mathews there have been studies done and printed in many scientific journals showing that prayer can be a powerful healing factor, and that he believes prayer could be "prescribed" by doctors to great benefit for their patients. Ken ended up training and serving as an active firefighter for almost five years before becoming their Chaplain, so he has a thorough understanding of the special kind of person it takes to do this job, and the challenges that they face. 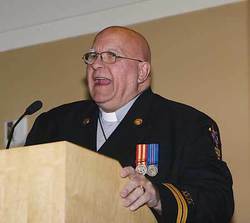 As Chaplain he provides all sorts of counselling services to the members and their families, including dealing with PTSD, marriage, financial, and addictions counselling, as well as spiritual guidance. He stated that his entire career has been a privilege and the experiences and friendships he has encountered in Leduc and area along the way have, at times, been life changing. In closing, Ken said with a smile, "I just thank God that I have been able to serve as Padre in this capacity for so long!"